New Jersey has become a partisan battleground over gun rights following a brutal incidence of violence that has pitted many domestic-violence advocates in the state against gun-rights enthusiasts — and, as it turns out, the governor himself. Gov. Chris Christie is reportedly sitting on a domestic violence bill that would reinforce legal protections for abuse victims by forcing alleged abusers to surrender their firearms. The 2016 presidential hopeful has yet to comment on why he's dragging his feet on the bill, but sources suggest it may have something to do with his newfound push for gun rights as he hops onto the conservative campaign trail. Current laws in New Jersey already require domestic abusers to surrender their firearms. However, New Jersey Democrats, led by Assembly Women and Children Committee Vice-Chair Gabriela M. Mosquera, have said the bill would provide law enforcement and courts more authority and resources, ensuring that these firearms are surrendered in a more timely and efficient manner. "The purpose of this legislation is to get the firearms away from abusers," Mosquera said in a press release back June as the bill made its way through committee. "The intent of this bill is very simple. It’s just taking those firearms away from individuals that have propensity to abuse individuals." Meanwhile, the Association of New Jersey Rifle and Pistol Clubs denounced the bill last month, calling it "overbroad, off-target, and fundamentally flawed" in a press statement posted on the organization's Facebook page. Christie has yet to publicly comment on whether he will sign or veto the domestic-violence bill. He has 45 days to either sign off or veto the legislation. New Jersey is a strange state to orchestrate a gun-rights campaign. The state already has some of the toughest provisions on the books, including a seven-day waiting period for purchasing a handgun, and up to a 30-day waiting period for receiving the handgun permit, according to the Law Center to Prevent Gun Violence. But the murder of 39-year-old Carol Browne by her ex-boyfriend, a convicted felon with a well-documented abusive past, has sparked a debate over these firearms provisions, and whether they ended up causing Browne more harm. Browne, a hairdresser, was stabbed to death on June 3 by her ex-boyfriend, Michael Eitel, on the driveway of her own home in Berlin Township. She had a restraining order against Eitel at the time, according to the Camden County Prosecutor’s Office, and was also waiting on her handgun permit, which was already days past the 30-day limit. As such, gun-rights activists have turned her murder into a talking point, including Christie, who’s been molding a more conservative platform for his 2016 presidential campaign. In late June, Christie responded to Browne’s murder by issuing an executive order requiring the state to expedite the permit application process for victims of domestic violence, including individuals who have a restraining order against their abusers. The measure would limit the waiting period for a handgun permit to 14 days. Christie saw his move as striking a balance between gun rights and domestic violence advocates, touting the measure as a way to protect the right to self-defense. "The Constitution grants and our courts have affirmed the individual right to bear arms as a fundamental right, and that is all the more important for those who are victims of violence or under threat," the governor said in the executive order. He added that the measure was a "common-sense step" to "protect the rights of victims and people at risk of violent acts by giving them priority." But the governor still won't move on the Democrat-backed bill safeguarding victims of domestic violence. His inaction on the bill has frustrated New Jersey Democrats, who believe the governor's executive order is just smoke-and-mirrors politics. "He [Christie] quickly released his executive order as a way of showing he is serious about victims of domestic violence," Mosquero recently told Mother Jones. "He could have signed our bill the same day. I'm not sure what he's waiting for." Still, it's a strange move for Christie, who has long been known as a supporter of gun control, much to the dismay of his conservative peers. 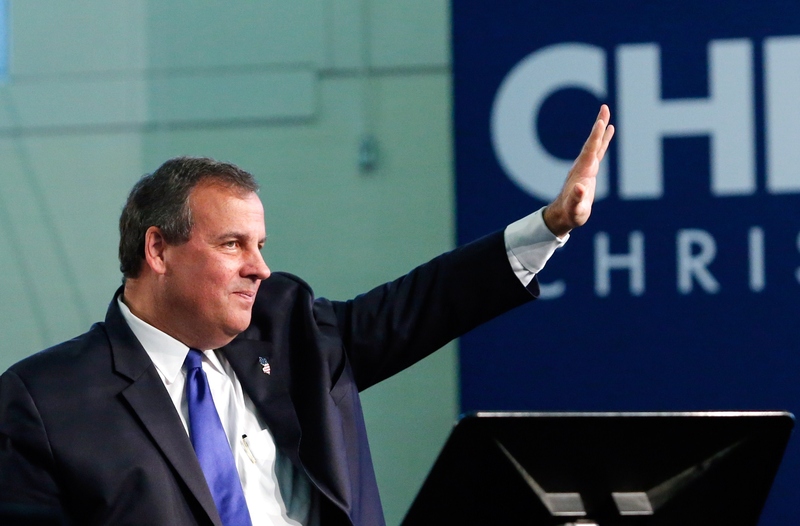 Christie has even gone on Fox News, plenty of times, to defend his state's strict gun laws. But considering that the governor's recent executive order loosening the permit waiting period, it appears the New Jersey governor may be looking to appease gun-rights lobbyists as he begins his journey to win over conservative America.The domestic violence legislation lingering on his desk, however, is troubling, considering the unfolding debate in New Jersey to strengthen protections for victims, who are more likely to be killed when there is a gun in the home, according to research from the National Institute of Justice. Earlier this year, former Congresswoman Gabrielle Giffords traveled to New Jersey to deliver this simple message for Christie and his colleagues: "Dangerous people with guns are a threat to women. Criminals with guns, abusers with guns, stalkers with guns — that makes gun violence a women's issue. ... We stand for responsibility." The governor's office has not responded to Bustle's request for comment on the bill. The Association of New Jersey Rifle and Pistol Clubs also did not respond to our request for comment.